On the Man of Steel (2013) Facebook page they changed the cover photo to the new logo. It's darker, grittier and more metallic. I'd love to know how you feel about it. 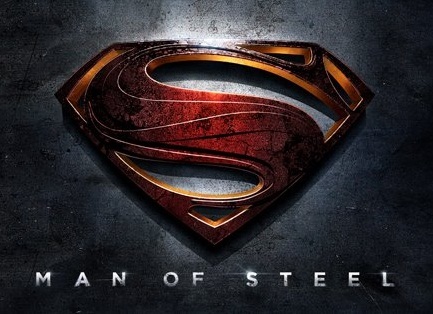 Eschewing the clean lines and look of past iterations of the Superman logo, the new "Man of Steel" logo goes with a metallic grittiness, deeper colors, and swooping lines and deep shadows. The new logo is a sufficiently dark look for what passes as a modern reboot, as it has a "I'm superman and I'm gritty and real" something about it. In the pantheon of superheroes, Superman is the most recognized and revered character of all time. Clark Kent/Kal-El (Henry Cavill) is a young twentysomething journalist who feels alienated by powers beyond anyone's imagination. Transported to Earth years ago from Krypton, an advanced alien planet, Clark struggles with the ultimate question - Why am I here? Shaped by the values of his adoptive parents Martha (Lane) and Jonathan Kent (Kevin Costner), Clark soon discovers that having super abilities means making very difficult decisions. But when the world needs stability the most, it comes under attack. Will his abilities be used to maintain peace or ultimately used to divide and conquer? Clark must become the hero known as "Superman," not only to shine as the world's last beacon of hope but to protect the ones he loves. So, here's where we ask you the readers. What do you think of the new logo? Do you think it says anything about the movie? It looks all right. I'm not a purist, so doesn't matter they changed it. i really like seeing the logo change over the years... this another great addition. It looks like something General Zod would use. Dark, and Gruesome. Note the serpentine "S". No longer BOLD, but "Slithery". Guess that's why the ladies over at the Huff like it so much. Bargain hunter good point. It has kind of a snake feel. Jeremy, there have been a lot of changes over the years. One more yes. Another good point Neil. Dragon like. One more yes vote. It can't be a lot worse than their last attempt to reboot the franchise. You're right PT. 'The Munsters Today' was embarrassingly bad. What about Tim Burton isn't bizarre? Yeah Mike, all the Superman movies are starting to get old. They need something fresh and new. The animated movies are good though. I like this a lot, it feels modern and more edgy. LIKE! Stephanie, edgy is the word. One more like!